If this was to be a sustainable bull phase, then measures of financial risk should be coming down. They're not, and that leads me to think that this market experienced a brief short covering rally and has more potential to the downside than the upside. Addendum: Soon after I put up this post, we have the news of coordinated central bank intervention in US Dollars, Sterling, "Japanese yen, euro, Swiss francs and Canadian dollars". Stocks have staged a rip-roaring rally. It is curious, however, that 10-year yields in Spain, Portugal, Ireland and Italy are all rising despite the news, indicating that the bond market believes that risk premiums are rising, not falling. The title, which refers to a possible "market crash", may seem untimely on an occasion when ES futures are deeply in the green, but the newsflow from Europe is getting more and more confusing. I would like to create a framework for assessing the likely future course of the markets rather than to just come to a prepackaged conclusion. On one hand, Fitch downgrade Portugal last week, then Standard and Poors downgraded Belgium soon after, which are bearish for the market. On the other hand, Bloomberg reported that the IMF is readying a loan facility of up to €600 billion to Italy, though the story leaves many unanswered questions and sound more like a trial balloon than an actual concrete plan. Moreover, there are reports that eurobonds are back on the table. To summarize the current European situation, imagine that a man (the "eurozone") experiences severe chest pains and looks like he is headed for a heart attack ("Lehman moment"). The protocol is well defined in these circumstances. Take steps to stabilize him ("inject liquidity via the ECB") and then address the causes with a program of diet, exercise and medical treatment ("longer term solutions such as balanced budgets, pro-growth policies, possibly closer fiscal integration, two-speed eurozone, etc."). Berating him about being lazy and overeating ("you lazy Greeks, Italians...") and making him get on the treadmill to work off his Thanksgiving feast ("more austerity and IMF monitors") while he is on the verge of a heart attack ("Lehman like financial crisis") is less than helpful under the circumstances. The question for investors is, "How far away are we from the heart attack, or Lehman moment?" My inner technician tells me to listen to the message of the markets. Here are the four main "tells" that I am watching for as signs of a Lehman-like event. First of all, let's look at the yield on the 10-year Treasury Note as it is one of the bellwether safe haven plays. The 10-year yield, while it is in a downtrend, moved down through support on Wednesday but rallied through resistance (turned from support) on Friday and is now testing the downtrend line. I would watch for a significant violation of this initial support and if the September and October lows hold. If they don't it would be a definite indication that the "bang" moment is upon us. The 30-year yield is looking more bearish than the 10-year yield. Unlike the 10s, the 30-year yield broke down through initial support and it's in an obvious downtrend. Violation of the lows seen in September and October would be a definite sign of trouble. Since Italy has been the one of the sources of weakness in the eurozone, it would be instructive to watch the FTSE MIB Index of Italian stocks. The MIB tested the 2009 lows in September, rallied and it is in the process of testing that support level again. Violation of this key support level would be a sign that a market crash is coming. Finally, I watch the Euro STOXX 60 Index as a barometer of market stress, and that index is behaving better than the MIB Index in Italy. The Euro STOXX 60 is in decline, but watch for how it behaves at initial support offered by the September lows and failing that, the 2009 lows. I suspect that before this is all over, much of the European banking system will be nationalized, much of the existing debt of the European banking system will be restructured, and those banks will gradually be recapitalized, post-restructuring and at much smaller leverage ratios, through new IPOs to the market. The European banks are the canaries in the coalmine of investor confidence and some of the canaries are starting to keel over. Consider, for example, the price chart of Banco Santander, a large Spanish bank. SANT is in a multi-year downtrend that began in early 2010 and it is now testing a key support level. Violation of that support would be a sign of rising stress levels in eurozone banks. The story goes from bad to worse. Here's the chart of Royal Bank of Scotland, a UK-based bank that should be somewhat more insulated from stresses in the eurozone. Apparently, it's not that insulated as the stock has violated near term support. A test of the 2009 lows is next and should those lows not hold, there's going to be trouble. Moving back to the Continent, the price chart of KBC Bank shows a dramatic violation of near term support as the price plunges towards the support zone offered by the 2009 lows. Moving to France, the share price of Credit Agricole has already violated the 2009 lows. More recently it has broken down through near term support of the September lows. This canary is on the ground and barely flapping its wings. The chart of another French bank, namely Societe Generale, is displaying a technical pattern of the violation of 2009 lows. It is now testing the support level from the recent September lows. The shares of Italian banks Intesa and Unicredit (not shown) are also showing similar price patterns of violating their 2009 lows. Even worse, there's Commerzbank. The price chart shows that the shares have violated its 2009 lows and continues to go into freefall. Should Commerzbank fail, will it be the new Creditanstalt? To be sure, not all European bank charts look as dire as the six that I have shown you so far. Most are in the pattern of Deutsche Bank, which is holding above its September lows and well above its 2009 lows. Holding up the Deutsche Banks as the poster boy for European banking stability and ignoring the rest is like the Black Knight in Monty Python's Holy Grail dismissing a chopped off arm as "only a scratch." Where there's smoke, there's fire. Should any of these aforementioned six banks fail, then other banks will inevitably lose their interbank overnight funding, which would then lead to a cascade of bank failures. Imagine a scenario where Commerzbank has failed. If you were a depositor or another financial institution, would you leave money with Societe Generale, Intesa, Credit Agricole, KBC Bank, RBS or Santander at any price? If the answer is "no", then what happens next to global banking funding? At which point, you can count on the FTSE MIB, the Euro STOXX 60, the 10-year and 30-year Treasury yields to plunge through their key support levels. The IMF Italy rescue plan and the eurobond stories are indications that the eurocrats are panicking. Whether the authorities can act in time to prevent the Lehman/heart attack moment is another. Watching how the markets react will give us the real answer of this race against time. Bloomberg reported this morning that, according to a report from La Stampa, the IMF is readying a loan facility of between €400-600 billion to Italy. ZeroHedge then tried to shoot down the story on the basis that €600 billion is a lot of money, which would need the approval of funding countries, including the US. At this point, I would more charitably say that the report of an IMF rescue of Italy leaves many unanswered questions. To put the scale further in perspective, compare them with the IMF’s ability to lend to countries in trouble. The technical term is the fund’s “one year forward commitment capacity” which for “Q3 to date” is 246.0 billion SDRs (September 15 update; SDRs are “Special Drawing Rights”, which exist only at the IMF.) On September 20, 1 SDR was worth 1.57154 US dollars, so the IMF could lend no more than 386 billion dollars — as one euro is worth about 1.37 US dollars this week, this is about 280 billion euros. €600 billion is therefore beyond the current capability of the IMF. Additional resources would have to come from IMF members, which will take time. The United States is one of the larger contributors to the IMF, which means that, were this measure to pass, the American taxpayer would be bailing out Italy. Would Obama give the nod to such a politically charged move just as he is entering a presidential election year? The ECB to the rescue? The size of the loan would make it difficult for the IMF to use its current resources so different options are being explored, including possible joint action with the European Central Bank in which the IMF would be guarantor. Conceivably, the ECB could lend to the IMF which then lends to Italy and monitors compliance with austerity programs imposed by lenders. John Hussman wrote an excellent analysis last week of why the ECB is unlikely to print to rescue Italy, or any single eurozone country. The principle of proportionality: "[I]f the ECB buys those bonds, and they don't pay off over the long-term, the ECB will have given a fiscal subsidy to those distressed countries, and Germany will end up bearing most of the cost." Legal barriers, which include lending to eurozone governments through third-parties like the IMF [emphasis added]: "The Treaty is very specific in restricting the ECB from assisting individual governments. Article 123 of the Treaty on the Functioning of the European Union prohibits the ECB from providing any type of credit facility to central governments (and specifically 'any financing of the public sector's obligations vis-a-vis third parties')." Money printing would be inflationary and run counter to the price stability mandate of the ECB: "I am convinced that a move to buy distressed European debt by creating euros would be seen as permanent money creation, and that far from seeing any safe-haven demand for euros, we would instead see a flight from the euro. As a result, European inflation would predictably accelerate." Also recall that I wrote last week (see my post No help from the ECB) the latest speech from ECB head Mario Draghi did not sound like a man about to print trillions of euros. The IMF loan story has more questions than answers. While a rescue package from the IMF would certainly be extremely positive, at this point the story sounds more like a trial balloon than an actual concrete plan. How will lenders react when they find out that their loans have been subordinated? If the lender is a bank, how will the bondholders and shareholders of the bank react? I have always stood firmly against a gold standard, but I remain a long-term commodity bull (yes that includes gold). I believe that while individuals should hold some precious metals or precious metal linked investments in their portfolios as a hedge against asset inflation, a gold standard introduces too many unnecessary rigidities in the system which creates economic volatility. I came out against a gold standard back in December 2008 and I stand by my previous comments. There are numerous problems with a gold standard, which is another form of fixed exchange rate regime. Most proponents of the gold standard tend to lean libertarian, which generally means the embrace of free markets and less government. There an inherent contradiction among this crowd that I just don't understand: How can someone who believes in free markets prefer government mandated fixed rates, which creates structural rigidities, to market determined floating exchange rates, which allows the system to adjust to changes in real-time? In other words, changes in money supply (gold) may not correspond to changes in the real economy - and that creates unnecessary booms and busts. The gold standard is a fixed exchange rate regime and the current eurozone crisis illustrates everything that's wrong with a fixed exchange rate regime. When Greece gets in over its head in debt but can't print money and can't devalue because they are locked into the euro, you have the recipe for the disaster that faces Europe. Sure, gold standards discourage fiscal profligacy and forces countries into austerity programs to make the numbers work. That sounds great in theory, but that road could also lead to popular revolts. Don't forget that Greece was ruled by a military junta not that long ago. Did the gold standard cause the rise of Nazism? Dylan Grice of SocGen (via FT Alphaville) believes that Germany's adherence to the gold standard caused the rise of the Third Reich. Germany’s ‘hard money’ principles and opposition to Quantitative Easing by the ECB are, more often than not, framed with reference to the hyperinflation in the Weimar Republic. Indeed, it’s a widely accepted truth that the horrors of the Third Reich were caused by the three year period of hyperinflation between June 1921 and July 1924. But not in the way many people think, reckons Dylan Grice. The SocGen strategist believes the reaction to the policies of Reichsbank president Rudolf E. A. Havenstein played a more important part in Hitler’s rise to power. But as the world economy collapsed in the early 1930s the gold standard broke up. Successive countries chose to devalue their currencies and inflate their way out of painful deleveraging (chart below). Germany was the exception. Haunted by von Havenstein's ghost, it fatefully chose to bear instead the brunt of gold standard deflation, experiencing a depression arguably greater even than America’s. It was then that something broke in Germany’s collective psyche. With resurgent Nazi support, Hitler won power in 1933, his rise facilitated not only by the 1923 inflation, but by the subsequent fear of inflation. Now, Germany did actually leave the gold standard in 1931 (via the imposition of capital controls) but it kept the value of the Mark pegged against gold. 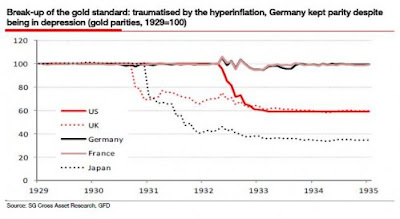 And more importantly, says Grice, Germany kept a gold standard mentality – the dictates of high interest rates and economic deflation were strenuously adhered to. Indeed, by 1932/3, unemployment had risen above 30 per cent. We make monetary policy in the real world, where shocks are a fact of life. That is why the Bank responds with a flexible approach, taking decisions guided by considered analysis and informed judgment rather than mechanical rules. Flexibility is required because, when taking monetary policy actions to stabilize inflation at target, the Bank must also manage the volatility that these actions may induce in the economy. Purists who wish for the return of a Golden Age of a gold standard should be careful about what they wish for. We might see the consequences of such inflexibility in Europe very soon. Further to my last bearish posts on Sunday and Monday, I was surprised to wake up and see the markets off tanking and made me feel like the character in the scene in The Holy Grail crying, "Bring out your dead!" What's more, I found a number of disturbing parallels of today's technical conditions with 2008. 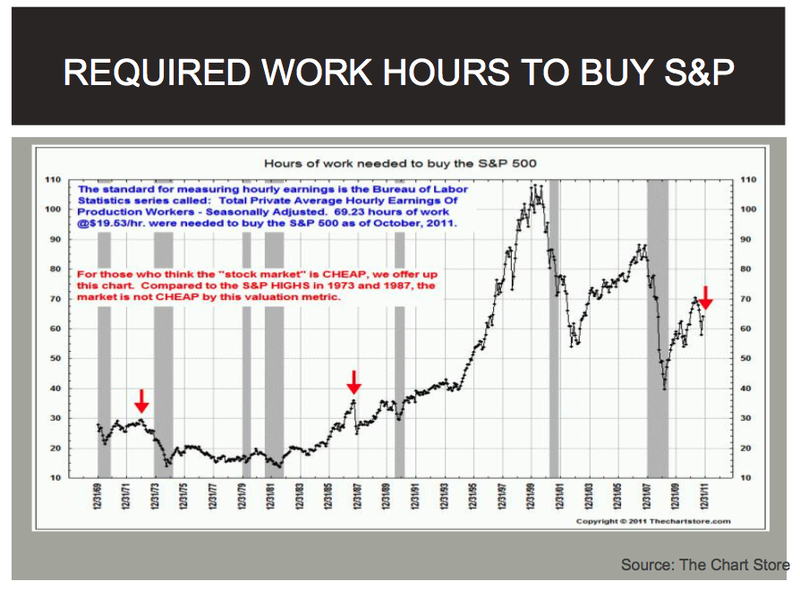 Consider this chart of the S+P 500. In 2008, the stock market undercut a major support level but the support violation turned out to be a fake-out as the bulls staged a last stand with a rally that lasted about two months. The waterfall then began after the rally fizzled out. Today we are seeing circumstances that are eerily similar. The market violated support in early October, but the bears had their faces ripped off by a rally. The rally is now appearing to petering itself out. If history were to repeat itself, then the market will break its early October lows in early December and panic selloff will then begin. It may have originated in the eurozone, but the current crisis looks to be following along the lines of the one that began in the U.S. subprime mortgage market four years ago. That is, a problem that authorities assured us was "contained" (the Bernank's famous last word) and resolvable has morphed into one that is uncontained and more dangerous by the day. As the chart shows, an average of credit default swap (CDS) spreads for 71 countries around the world has now surpassed the peak seen in September and is hitting its highest level since April 2009. (Simply put, CDS are bets on the creditworthiness, or lack thereof, of a particular borrower). The stress points are also showing up on this side of the Atlantic. In the wake of the failure of MF Global, Bruce Krasting wrote that the event could lead to a loss of confidence in broker-dealers because of the missing $600 million in segregated account funds. Indeed, a look at the relative performance of the Broker-Dealer Index against the market shows the XBD to be underperforming, just as it did in 2008 leading up to the Lehman Crisis. In fact, the rally that began in early October 2011 only showed up as a blip as the XBD remained in a relative downtrend dating back to January 2011. Symptomatic of the current atmosphere of nervousness on this side of the Atlantic, it appears that now Jefferies is now under attack. Regardless of whether the concerns are correct or misplaced, medium sized firms can go under quickly because of a loss of confidence as Bruce Krasting pointed out that Drexel became insolvent within ten days of losing its funding sources. Should the 10-year yield fall to those levels from the current reading of 1.96%, such bond-bullish conditions would imply incredibly bearish conditions for the stock market. In other words: Bring out your dead! Despite being in the headlines all the time, my head hurts whenever I think about Europe, At the end of day, what matters more to stock prices are earnings, growth expectations and interest rates. Notwithstanding the macro risk coming from Europe and the US, my concern for the near term outlook for stock prices is a slowing global economy. Friday's release of the Leading Econmic Indicator (LEI) came in at 0.9%, which was ahead of expectations. This appeared to provide some cheer to the market. I have found that the LEI to be of marginal use when calling turns in the economy, largely because forecasters focus on it so much and it has been tweaked so many times. A more reliable indicator is the ratio of Coincidental to Lagging Indicator (RTCL), which is released at the same time as the LEI. That ratio, which has been in recessionary territory for several months, sagged again on Friday. One of the theories behind this ratio is that when the expansion is nearing its final stages both sets of indicators will be rising, but the increase for the coincident will be slower than the lagging hence the ratio will fall. Richard Yamarone notes in his book “The Trader’s guide to key economic indicators” that this ratio has fallen before every recession since 1959. Legendary investor Ken Fisher is also known to use this ratio in his view of the economy. In 1992 Fisher noted that “when this ratio is rising sharply, always be bullish” and “when it is falling, adopt your most bearish posture”. As if that isn't bad enough, we have contractionary fiscal policy as another short-term drag on the economies of Europe and America. Within the eurozone, there is fiscal austerity everywhere from Greece to Italy and France. The official deadline for action by the Joint Select Committee on Deficit Reduction is Wednesday, the day before Thanksgiving. The real deadline is Monday night, since any plan has to be posted for 48 hours before it’s voted on. So conversations this weekend revolved around how to shut this turkey down. Aides expect some “Hail Mary” offers on Sunday, and there’s something on the stove that could be inoffensive to both sides. But the committee may not even have a fig-leaf agreement to announce. Total, embarrassing failure. The markets and the country will hate it. The other reason to care about the Super-Committee is that this is the best vehicle, apparently, to ensure a continuation of the payroll tax cut, which went into place last year. It hasn't been an amazing boon to the economy, but a reversion back to normal rates would certainly be an unwelcome drag on GDP. 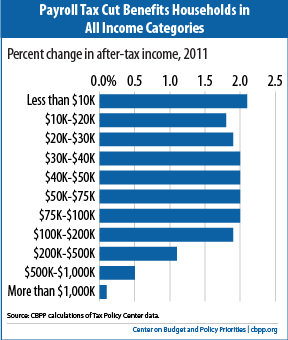 According to this chart from the Center for Budget and Policy Priorities, allowing the payroll tax cut to expire would hit most American households by 1% to 2% of after tax income. Such a move would have substantial negative effects on consumer spending. There were a few tricks in Q3 earnings, but most earnings reports were a treat. So it was another great quarter for earnings. Q3 is shaping up to be the eighth quarter in a row of double- or triple-digit earnings growth. As of October 28, the actual/estimated blended growth rate was 16.3% y/y. For the 330 S+P 500 companies that reported so far, the average earnings growth rate is 24.1%. That’s the good news. Not so good is that while Q3 is beating the consensus analysts’ expectations at the start of the earnings season for the eleventh quarter in a row, the analysts continue to lower their Q4 and 2012 estimates. They must be getting quite a bit of downbeat guidance from company managements that’s more than offsetting the upbeat Q3 surprises. Falling earnings estimates and signs of weakening economic growth are are ominous for stock investors and suggest that bear is returning. Timing the return of ursine dominance of the markets is difficult as we are in a period of positive seasonality and deteriorating fundamentals have a habit of not mattering to the market until they matter. Right now, the high frequency US economic releases are suggesting modest growth, but the forward looking indicators aren't looking so good. When will the markets start to react to the negative headlines? I have no idea, but given the negative overtones given off by the ECB, I am comfortable with position of the Asset Inflation-Deflation Trend Model, which is about to turn bearish with a "deflation" signal indicating a position of maximum defensiveness barring a substantial rally in risky assets by the close Monday, which does not appear likely as ES futures are deeply in the red as I write this. No help from the ECB? Continuity first and foremost refers to our primary objective of maintaining price stability over the medium erm. Does this sound like someone who is about to turn around and print €1-2 trillion to save the eurozone? Or is he just posturing in order to brandish his anti-inflation credentials to the Germans? Will he even print if Merkel gives him the nudge-nudge-wink-wink approval? If I were to take that speech at face value, then the most generous interpretation is that Draghi is saying that we will not print unless the ECB mandate is changed. In that case, the markets won't like this at all. OK. Not only have Spanish and Italian bond yields have blown out against Bunds, now French yields are blowing out and there are suggestions that even Bunds are losing their safe haven status. The contagion has moved from the periphery to the core of the eurozone. The whole eurozone is unraveling as disunity is the story of the day, as an example consider the Bloomberg report Irish Government Draws Fire as Budget Plans Shown to Lawmakers in Germany. In the past, we would have seen some market soothing statements from Merkozy by now, but the French and Germans are at odds and we therefore have no statement. What does Germany really think? There is a consensus that the ECB has to act now and buy the sovereign debt of the troubled peripheral countries to stabilize the markets and buy some time for the eurozone governments to work out a solution their long-term imbalances. Hardliners in Germany, led by the likes of Jens Weidmann of the Bundesbank, have been adamant against such a move. The question is, what does Angela Merkel do? Merkel has been all over the map on this issue. She has shown herself to be staunchly European and does not want the eurozone to break up. On the other hand, the revelation that Germany and France were conducting informal talks about a two-speed eurozone does not make her sound very European at all. In addition, the current government position that the the ECB cannot be the lender of last resort and the EFSF must not be given a banking license so that it could be supported by the ECB appears to be designed to push the eurozone over the precipice. The nature of these meetings is that the hallway chatter is always more interesting that the formal program. Part of the reason why is that, particularly when talking to journalists, the businesspeople or politicians tend to regard those conversations as off the record. So I'll abide by that here. One of the German execs was a consultant, and the other headed what I'll call a quasi-official German organization. They were slightly irritated by the pessimism I'd expressed earlier in the day. "Don't you realize," one of them said, "that the cost to us (Germany) of bailing out Greece is far less than it cost us to reintegrate East Germany after the wall came down in 1989?" I almost choked on my croissant. Yes, I replied, I am aware of that. I lived and worked in Berlin as a journalist in the mid 1990s, when that very painful (economically speaking) process was taking place in Germany. But doesn't that, I said politely, rather beg the question: Germany integrating their brethren, who'd been isolated and impoverished during the cold war, was a dream come true, whatever the cost. Germans, on the other hand paying to bail out Greece is, to average German, rather the opposite of a dream come true, is it not? He waved me off. No no, he said, it will be taken care of. The Germans, he said, understood how beneficial to them membership in the euro zone has been. Without it, the gentleman said, the value of the Deutschemark would be 50% or 75% higher than it is under the euro. "German industry would be wiped off the map." Now the consultant perked up, speaking what he too believes to be the unvarnished truth. They have to, he said, because "to be blunt about it, we have them [both the Greeks and the Italians] by the balls." And make no mistake – that, in essence, is where the European crisis stands. The Germans -- and the ECB along with them -- believe (perhaps hope is the better word) that two new technocratic prime ministers, former EU commissioner Mario Monti in Italy and MIT-trained economist Lucas Papademos in Greece, will cast politics aside and force angry populations in both countries to take their medicine, whether they like it or not. Because it's for their own good, you understand. And besides, "we have them by the balls. They have to do what we say." I believe that Merkel is well tapped into this German attitude, but she has stared into the abyss and realizes that Germany is at risk of overplaying its hand in pursuit of the goal of greater fiscal integration. As Tim Duy correctly points out, Merkel & Company is playing a very dangerous game of chicken and the whole edifice could come tumbling down should anyone make the wrong move. She is therefore trying to soothe German attitudes (I am on your side) but at the same time steer the German public consciousness toward the view that maybe Germany doesn't quite have Greece/Portugal/Italy/Ireland by the balls. To do that, Merkel will have to manufacture a crisis. The brinkmanship and all the hawkish statements coming out from Germany that we see today may be just for public consumption. This is all theatre to show that we are indeed headed for a crisis, so they have to take extraordinary measures to save Europe. “For months, since the very beginning of the Euro debt crisis, Germany has had only one goal, that is to bring about a stabilization of the Euro zone in its current form, to make it more competitive, to consolidate budgets,” Merkel told a news conference after talks with Romanian President Traian Basescu. At party conference this week in Leipzig, Ms Merkel’s Christian Democratic Union left room for manoeuvre, however. Bond purchases by the ECB were acceptable as a “last resort,” the party agreed in a resolution at its annual conference. The ECB may yet get to show what it can do. At the about same time, the German Council of Economic Experts, or the "Five Wise Men", has drawn up a plan for a European Redemption Fund at sounds a lot like a eurobond with strings attached. The idea of eurobonds has been anathema to the German public and the German government. The "five wise men" is a council of economists nominated by the government to advise on government policy. Could such proposals be a way of floating a trial balloon while allowing Merkel's government to distance itself should political opposition become fierce? Mr Asmussen would not be drawn: “If you speculate about plan B, then plan A is kaput.” Plan A rests on five factors, all of which have to be in place, he said: a plan for debt resolution and growth for Greece; the prevention of contagion to Spain and Italy; creating a firewall by getting banks to mark down their holdings of government bonds and add more capital; building another firewall with the EFSF; and, finally, setting a road-map for deeper monetary union. Nobody really expected Mr Asmussen to discuss plan B. Nor was he likely to reveal his innermost thoughts. But so cleverly did he speak that there will be no loss of face one day when the government rolls out plan B. Given that the crisis is already here, the question of a rescue is one of timing. Already there are rumors circulating about a plan for the ECB to lend to the IMF, which then lends to the troubled peripheral countries. The stars appear to be lining up for such a move. The plan makes sense as the IMF has the resources to monitor individual countries for adherence to austerity programs while the ECB does not. Such a move also provides a fig leaf for the German government to appease the hardliners as this plan does not appear to violate any treaty terms. I would warn the bears that this has the markings of a possible fake-out. The index is now resting at its 50% Fibonacci retracement level and I would suggest, even if you are bearish, wait for a reflex rally to get short. The conundrum for traders is a question of timing. Does Merkel have the political capital to put such a plan in place now? Or does she have to allow the crisis to continue in order to scare the living daylights out of everybody in order to say "we had no choice but to act"? Give the MFG story another month and it will be a problem. It will undermine markets. It will impact confidence in our financial system. It will impact liquidity. As those things occur it will force both Treasury and the Fed to take actions. While those actions may not take the form of any direct bailout of MFG and/or its customers there will be a significant cost to the broader economy. I have no doubt that money in seg. accounts at the likes of Merrill and Morgan Stanley is safe. That does not matter. The cheapest thing one could do is put cash outside of seg. accounts. The most expensive thing one could do is leave it there and face a loss of principal. It’s a very lopsided risk and reward. Weekends seem to be a good time for the authorities to act and there are wheels within wheels with the politics of this eurozone crisis and traders should just react to headlines. Don't ever forget why the EU came together in the first place and how committed the elite to this marriage. At the very least, bearish traders may want to wait until Monday before putting on short positions. Last week, David Rosenberg (via Pragmatic Capitalism) stated that "we’re just 4 years into a depression that will likely last 7-10 years". Ken Rogoff, interviewed by CFA Magazine, said that the current slowdown that began in 2008 is likely to take 6-10 years for a recovery to take hold. This confirms my views from August that I expect a stock market bottom about the end of this decade. This is a secular bear market characterized by flat returns and investors need to re-orient their investment policy and portfolio strategy accordingly. To recap my first point about a secular bear market, equity valuations are not especially attractive right now. The chart below from VectorGrader (chart is theirs, annotations are mine) shows the market cap to GDP of US equities from 1950. I use market cap to GDP as a proxy for the market Price to Sales ratio. Many investors look at P/E ratios, but P/Es can be volatile since P/E = P/(Sales x Net Margin) and net margins can be volatile depending on where you are in the economic cycle, but Price to Sales is a far more stable ratio for evaluating long-term market valuations. Note how the bull phases, or secular bulls, coincided with expansion of the market cap to GDP ratio. The equity market then topped out went sideways and entered a secular bear market, which coincided with a corrective phase in the market cap to GDP ratio, until that "valuation" metric returned to more realistic levels. 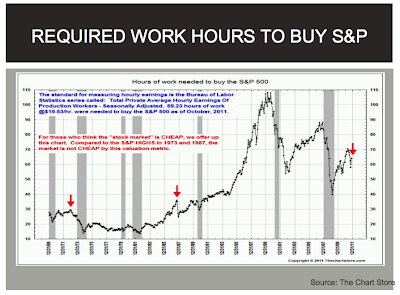 Similarly, this chart from Naufall Sanaullah of Shadow Capitalism tells a similar story. The chart shows the require amount of work to buy the SPX as a measure of the differential between the returns to labor and capital. Just like the Market Cap to GDP chart, this relationship remains stretched in favor of equity. Using a rough eyeball estimate of both charts suggests a valuation bottom some time around the end of this decade given the current trajectory of adjustments. These conclusions are in accordance with the views of David Rosenberg and Ken Rogoff. Even though I am trained as a quant, I have always thought myself to be an investment strategist first and a quant second. There are different tools for different seasons. Otherwise, you can get caught and wind up holding pruning shears in a February snowstorm or holding a snow shovel in the heat of July. In secular bull markets, such as the one we experienced in the 1980's and 1990's, buy-and-hold was a great strategy for portfolio construction. Stocks went up. To control risk, you just added some bonds to control volatility and voila, a portfolio that balanced risk and return. To raise expected returns, you raise the equity weight at the cost of greater risk. To lower risk, you raise the bond weight at the cost of lower expected returns. During secular bear markets characterized by flat returns, buy and hold investors are likely to see flat but volatile returns. Raising the equity component in a balanced portfolio just raises volatility, but does not significantly increase returns. Under these conditions, investors need to use dynamic asset allocation techniques such as the Asset Inflation-Deflation Trend Model to capture the swings of a flat market. When I vote in an election, I give very little weight to a politician or party's stated policies. Instead I look at the candidate's overall philosophy to see how he or she would govern. Politicians change their minds. What's more important is how they would behave when circumstances change. A hundred and fifty years ago, around 1861, China and Japan both collapsed as Western gunships and financiers pushed into East Asia. Nothing Japan or China could have done would have stopped the rise of Western wealth and power. How they reacted to that rise, however, made all the difference between triumph and tragedy. China's rulers borrowed heavily from overseas, squandered the capital, and fell into dependency. Japan's rulers bought time, raised huge amounts of local capital and financed an indigenous industrial revolution. By 1911, Japan was a great power and China was the sick man of Asia. A century and a half later, the EU faces the same choices. Nothing it can do will stop the rise of the Eastern wealth and power - in 100 years, Asia will be the world's economic powerhouse - but how it reacts matters very much indeed. That's why Europe's major trading partners, such as the Americans and the Chinese, have said repeatedly that Europe has the capability to solve the problem themselves. If we were to take Trichet's comment at face value, then the obvious way forward is fiscal union, to be followed by political union at some point in the future. The alternative is to kick some of the weaker countries out of the eurozone at the price of fracturing European unity. But then, what countries don't have underperforming regions? In the United States, you just have to compare the glittering metropolises of New York, Boston and Los Angeles with parts of the Deep South, or Puerto Rico, to see examples. The question then becomes, how will Europe go forward with a solution? Unfortunately, the history of the European Union is littered with compromises and half-measures that don't always achieve the original stated objective and have the potential to fail because of some fatal flaw. When the euro was formed, I recall that there was some question as to some of the weaker Club Med countries would be allowed into the eurozone. I suppose that, in the end, countries like Greece and Portugal were allowed in the spirit of European unity and the tradition of European compromise. In the same way, the European Central Bank was mandated to only fight inflation as a nod to German price-stability sensibilities. Today, the fatal flaws of the lack of a dual mandate and the prohibition to being the lender of last resort to sovereigns has pushed the eurozone to the edge of the abyss. The price of a cobbled-together rescue is that some day the euro zone will probably have to endure yet another existential crisis. It is all very well to talk of discipline and oversight right now, when disaster is still an imminent possibility; but wariness is bound to fade with time. Bubbles inflate precisely because people fail to recognise that they are living with dangerous imbalances. One French official remembers being told by commission economists during the boom to copy Ireland and Spain. Now the same people are telling him to copy Germany. The question of whether the eurozone achieves a political or fiscal union, or the weaker countries get kicked out of the euro will be irrelevant in 100 years, but both roads will be hard. What matters is a robust solution, and not a weak half-measure, is implemented. Europe should choose the Japanese path. It will take trillions of euros to contain the crisis and the pain will be immense. But the alternative, of mortgaging Europe's future with Chinese loans, might prove worse. I wrote in my last post of why I believe Europe came to be and I find it amazing today how many of its inhabitants are utterly European in outlook and remain committed to the idea of a European Union (see one of many examples here). It is now up to them to forge a solution that will stand the test of time. As those of us who live in British Commonwealth countries commemorate Remembrance Day, I want to reflect about what this day means to me, especially in the context of the eurozone crisis today. Our story begins at the close of World War II. As that war drew to a close in 1945, the leaders of Western Europe came together and surveyed the wreckage. For centuries Europe had been racked by conflict, centered mainly between France and Germany. As an example of the level of carnage, consider that the French and Germans lost over 800,000 men (dead, wounded, missing and captured) in one single battle – the multi-year Battle of Verdun in World War I. By way of comparison, the Verdun casualties were double that of American loss in Vietnam dwarf American casualties in either the Korean Conflict. The Europeans said “never again!” Thus the EU was born. In 1957, the European Economic Community (EEC), also known as the Common Market, was formed. The intent was not purely trade liberalization, but to bind Germany to Europe so tightly that major European conflicts could never happen again. The EEC later became the European Union (EU). Further economic integration occurred in December 1995 when many EU countries adopted the euro as a common currency. This strategy of peace through economic integration has largely succeeded. If the Germans were to mobilize the Bundeswehr today and announced to the troops that they were going to war with France, the men would all laugh and go home. That is the miracle of Europe. As players on the European stage manoeuvre for advantage, we must not forget the Big Reason for the formation the European Union. Also don't forget the terrible price that could be paid by future generations should the current crop of leaders fail. The change has been discussed on an "intellectual" level but had not moved to operational or technical discussions, the EU official said. A French finance ministry spokesman denied there was any project in the works to reduce the currency bloc's membership . More interestingly were the affirmations of this highly risky approach from both Paris and Berlin. French President Nicolas Sarkozy gave some flavor of his thinking during an address to students in the eastern French city of Strasbourg on Tuesday, when he said a two-speed Europe -- the euro zone moving ahead more rapidly than all 27 countries in the EU -- was the only model for the future. Speaking in Berlin, Merkel reiterated a call for changes to be made to the EU treaty -- the laws which govern the European Union -- saying the situation was now so unpleasant that a rapid breakthrough was needed. From Germany's point of view, altering the EU treaty would be an opportunity to reinforce euro zone integration and could potentially open a window to make the mooted changes to its make-up. Who is trying to do what to whom? So here is the question: If discussions had been going on for a month, why did the story break yesterday of all days, when the financial markets were in turmoil? This was probably a leak. It sounded like too orchestrated to me. It seemed to me that it was done for maximum impact. Angela Merkel has come to the realization that only the ECB can save the euro. She had the story leaked to throw panic into the markets to pressure the German hardliners within her government and the Bundesbank. In that way, it would give her political cover to give Mario Draghi the nod to start monetizing debt. The French want the ECB to act. They had the story leaked to throw panic into the markets to pressure the German hardliners within the German government and the Bundesbank. Mario Draghi and the ECB wants Silvio Berlusconi out sooner rather than later. This was leaked to throw gasoline on the fire. Veteran EU watchers say the leaks appear to be a heavy-handed attempt from certain quarters in Berlin to force austerity compliance in southern Europe. Personally, I think that either 1 or 4 are the most likely possibilities. In typical European fashion, there seems to be a lot going on behind the scenes with different factions of the elite jockeying for position. The good thing is that the Germans are actually having a hard internal debate of what they want out of the EU and the eurozone. So I take it back. This was not a Merkel capitulation and panic moment. But don't just watch and react to the headlines, there are wheels within wheels as pawns are maneuvered around the European chessboard. Is this the Merkel capitulation? When will bad news be good news?